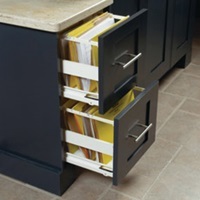 Cabinet drawers are available in multiple styles and configurations. 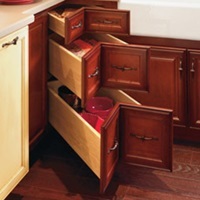 Whether you need cabinet drawers for your kitchen or other rooms in your home, it helps to know what kinds are available. 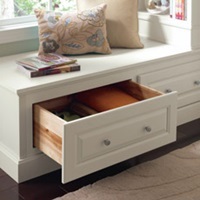 Following are some examples of cabinet drawer fronts and drawer cabinets. Kitchen corners are considered a "black hole" by many homeowners, but MasterBrand has several solutions to make it a useful space, including Corner Drawer Cabinets. Cabinets specifically designed for file folders, like this File Drawer Cabinet, can make a home workspace more functional. Extra-strong Furniture Drawer Cabinets are built to hold heavy items, from bulk-packed foods to several bottles of laundry detergent. 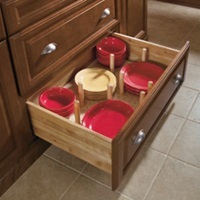 Avoid lifting stacks of heavy dishes from an upper cabinet with a drawer that comes with an adjustable Pegged Dish Organizer to keep dishes neatly in place. 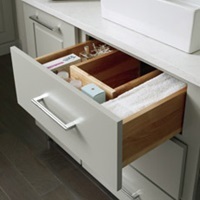 A U-Shaped Vanity Drawer fits around the sink plumbing in your bath, allowing you to use all of that under-counter space. 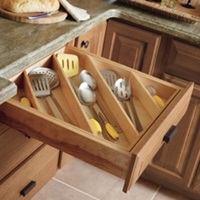 A diagonal drawer insert, like this Cooking Utensil Divider, stores long utensils diagonally to make smarter, more efficient use of drawer space. 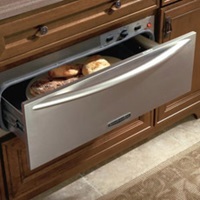 A Warming Drawer Cabinet ensures dinner is hot and ready when guest arrive, or if family members come home late.